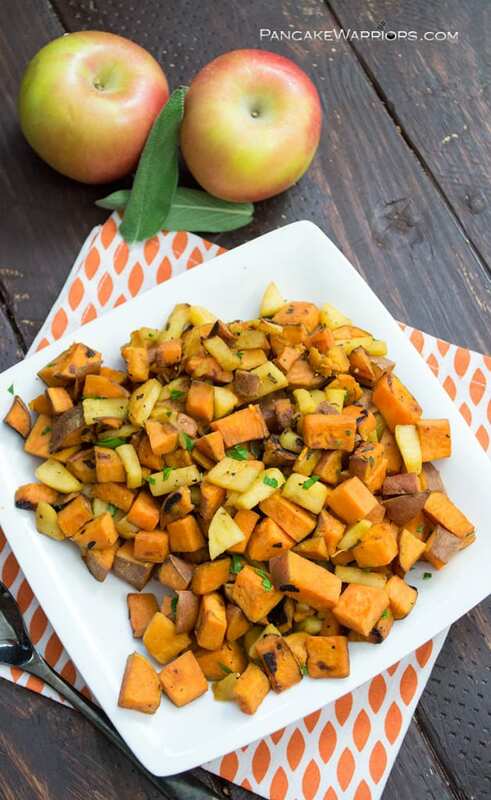 This quick apple sweet potato hash is for those days when dinner just needs to be something quick, easy and filling. 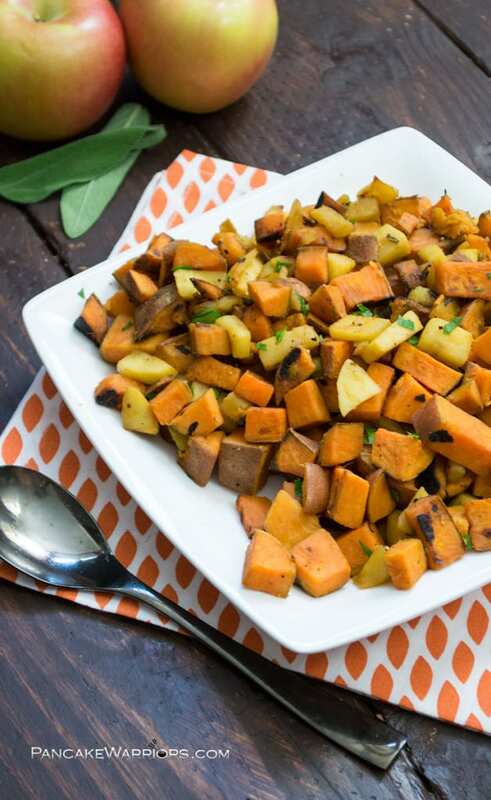 Pair with leftover chicken, eggs over easy or simply sprinkled with hemp hearts and served with a simple green salad or spinach, this quick apple sweet potato hash is the perfect fall side dish. 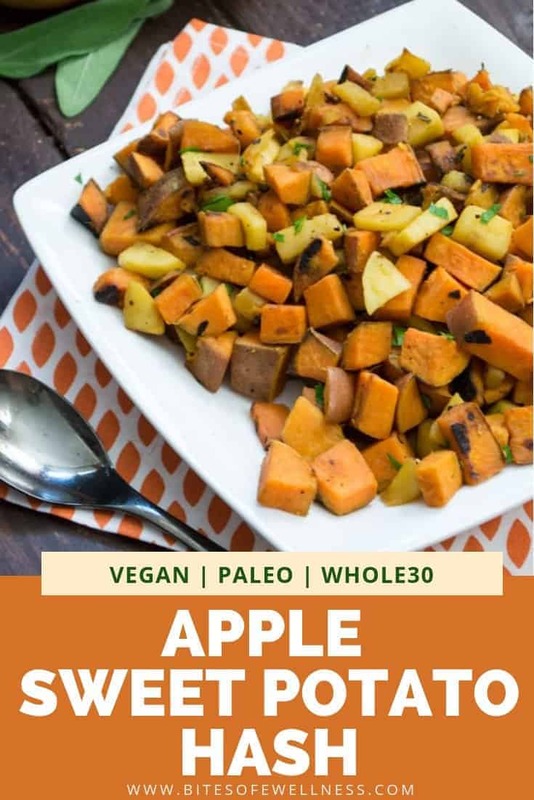 Breakfast, lunch, brunch or dinner, this apple sweet potato hash is simple enough to make anytime. Dave and I went to the apple orchard this past week, and I’ve been looking for ways to add apples to our everyday meals. We make sweet potato hash at least 2-3 times a week. Not only is it super simple, but it helps provide complex carbs and are a great way to refuel after a workout! Dave and I both put sweet potatoes at the top of our lists of favorite carbs. Add in chopped apples and you get a new layer of sweetness, the apples almost caramelize a bit. Talk about heaven! This is a must try combination! To get this recipe on the table in under 15 minutes, I took a short cut and used the microwave to get the potatoes most of the way cooked. If you are against the microwave, you might have to add 10 more minutes to this recipe, but it would still qualify as dinner in under 30 minutes! The key to getting potatoes to cook quickly, cut the potatoes small, and make them uniform. This is a lesson I’m still trying to teach Dave. Poor thing gets so hungry after we workout, then he gets frustrated when his potatoes don’t all cook at the same time. 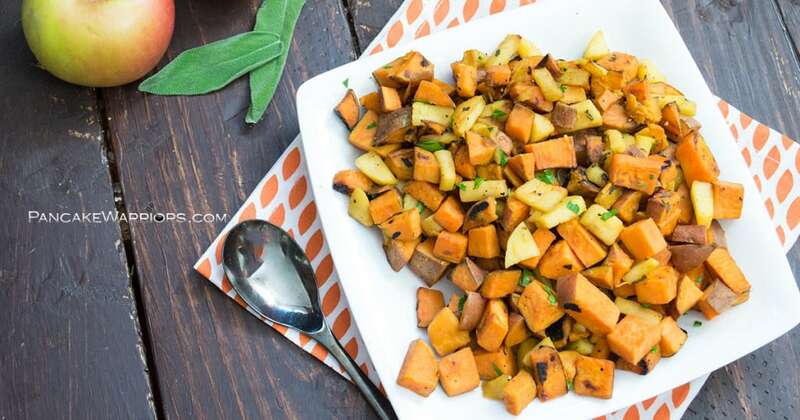 Love Sweet Potato Hash? 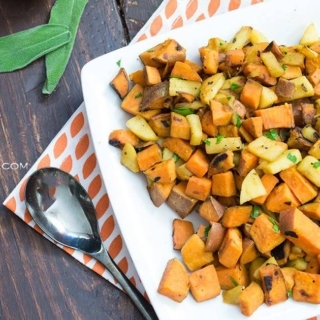 Be sure to check out this Sweet Potato Breakfast Hash. 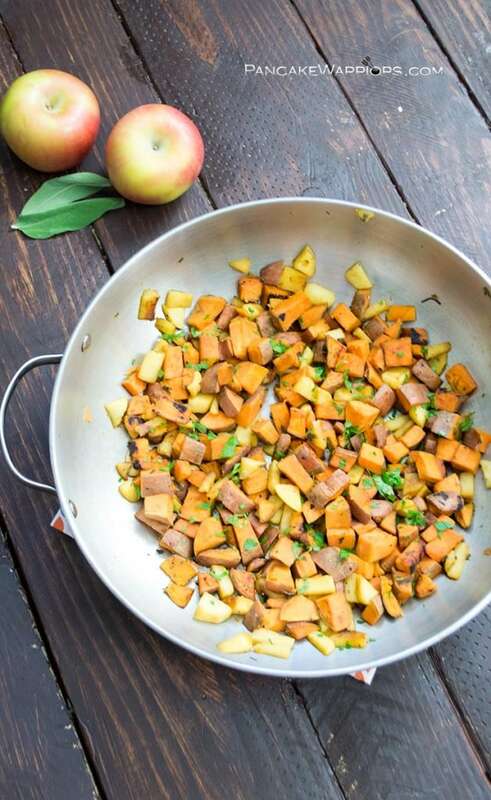 This quick apple sweet potato hash is the perfect side dish. Great for breakfast, lunch, brunch or dinner! Quick, simple vegan, gluten free, low fat and full of flavor! Dice sweet potatoes into uniform cubes. Place into a glass bowl and microwave for 6-8 minutes. Peel and chop apples while sweet potatoes are cooking. Preheat a large skillet over medium heat. Add 1/2 tbs. coconut oil to the skillet. Add the sweet potatoes and chopped apples to the skillet. Chop sage and add to the skillet. Add salt and pepper. Cook for 5-7 minutes over medium heat, Stir occasionally. What’s your favorite way to eat sweet potatoes? Do you have any quick time saving hacks? Will this still work without the sage? Yes! I hope you were able to enjoy this! Yum! I pinned this recipe a few weeks back but just made it today. My first time making a sweet potato hash. So tasty! This looks great. I”m working on a sweet potato round up for this week for the Small Victories Link up….so you’ll definitely be my featured blogger from last week’s link up when it goes live tonight/tomorrow. YUM! I am so down with all of the ingredients here… will definitely have to make this! Thank you for linking up at Snickerdoodle Sunday- hope to see you again later today.